Given the performance uncertainty of the Mariners’ projected starting rotation, scoring more than three runs in a game could be vital for success — as it was in 2017. Seattle posted a 70-26 record when scoring four runs or more and 8-58 record when scoring three runs or less. “Our strength obviously for me is our lineup and our strength is what makes it dangerous, and I don’t think we want to get away from that,” he said. Servais has said on multiple occasions that Gordon will be his leadoff man this season instead of Segura, who was in that spot for 119 of the 125 games he played in last season, hitting .305 with a .353 on-base percentage and 19 stolen bases. But the lefty-swinging Gordon will move to the top spot, giving the Mariners alternating left-handed and right-handed hitters till the seventh spot in the order. Last season, Gordon was in the leadoff spot for the Marlins for 144 games, hitting .308 with a .341 on-base percentage and 57 stolen bases. While Segura has above average speed, Gordon possesses elite speed and is a better base stealer and better overall baserunner. He posted a 9.2 on Fangraphs baserunning metric, meaning he was worth 9.2 runs more than the average runner. It gives Seattle an improved dimension in front of Cano, Cruz and Seager, who are still the key to the Mariners’ run production. The trio of former All-Stars won’t be forced to carry the offense like in years past, but they will still be vital to its overall success. Cruz is entering the final year of his contract and has shown only minimal signs of slowing down at the plate despite turning 37 in July. A year ago, he hit .285 (160 for 556) with a .924 on-base plus slugging percentage, 91 runs scored, 28 doubles, 39 homers and 119 RBI in 155 games. Despite the penalty of playing most of his games at DH used in the metric, Cruz posted the highest Wins Above Replacement (WAR) from Baseball Reference (4.1) and Fangraphs (3.8) on the Mariners. The 119 RBI was the most in the American League and he picked up a Silver Slugger award and the Edgar Martinez Outstanding Designated Hitter Award. Cano and Seager didn’t quite have the same level of seasons in 2017 that they are accustomed to for various reasons. Nagging lower leg injuries plagued Cano all season. He dealt with hamstring and quadriceps strains and his production dipped from his monster 2016 season. Cano hit .280 (166 for 592) with a .791 OPS, 33 doubles, 23 homers, 97 RBI in 150 games played. Privately, both the Mariners and Cano felt that the WBC may have been a hindrance to his revamped offseason and spring preparation routine that had led to a bounce-back year in 2016. Haniger’s first full season was sidetracked by two extended periods on the disabled list, which limited him to 96 games. But he hit .282 (104 for 369) with an .843 OPS, 25 doubles, two triples, 16 home runs and 47 RBI. The Mariners believe those numbers will only improve if he can stay on the field. Healy, 25, hit .271 (156 for 576) with 29 doubles, 25 home runs and 78 RBI in 149 games last season. He will be the everyday first baseman. No more platoons at the position. “We like the bat, like the upside of the player, he’s got power, continue to focus on controlling the strike zone to get the most out of the power and what pitches to hit,” Servais said. But it’s the emergence of Zunino that could be a true difference maker. After a rushed progression through the minor leagues and struggles for multiple seasons, he seemed to blossom after a May demotion to Class AAA Tacoma. He hit .251 (97 for 387) with an .284 OPS, 25 doubles, 25 home runs and 64 RBI in 124 games. Few teams get that sort of production from the catching position. But can it be expected? 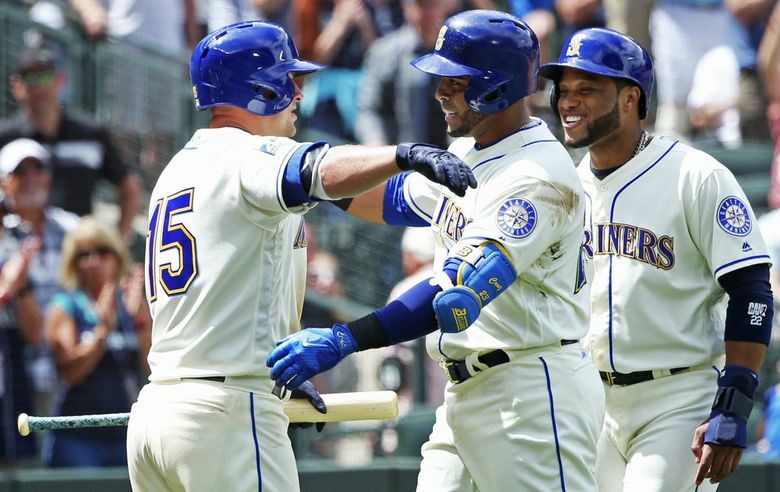 When Servais met with Cano, Cruz and Segura in the offseason, he found plenty of similar optimism about the lineup.